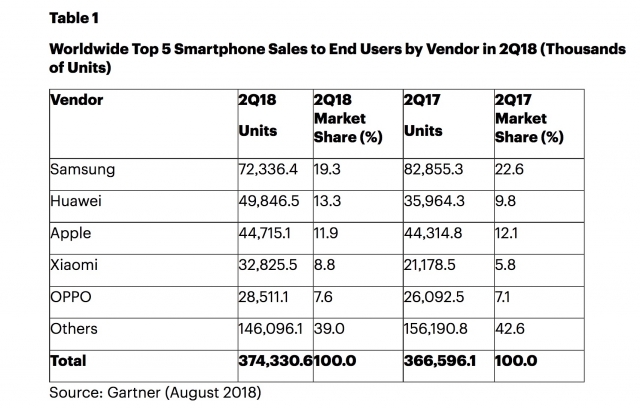 It looks like that Huawei is the second largest smartphone vender surpassing Apple. The company reportedly sold more smartphones in the second quarter of 2018 than Apple. "Huawei’s smartphone sales grew 38.6 percent in the second quarter of 2018. Huawei continues to bring innovative features into its smartphones and expand its smartphone portfolio to cover larger consumer segments," said Anshul Gupta, research director at Gartner. "Its investment into channels, brand building and positioning of the Honor devices helped drive sales. Huawei is shipping its Honor smartphones into 70 markets worldwide and is emerging as Huawei’s key growth driver." Samsung faces slowing global smartphone demand and ever-growing competition from Chinese manufacturers," said Mr. Gupta. "The slowing demand for its flagship smartphones left Samsung with lower profitability. It now expects the Note 9 smartphone to revive growth.